This is for everyone, but especially medical professionals who may not fully understand. On behalf of the ME/CFS community, we plead you not dismiss or ignore the severity of our condition, for as demonstrated in this eye opening movie, it is one of the most disabling physical illnesses on earth. Please watch the 3 minute video before reading further, you will understand much more if you do. To those that already understand & looking at the latest research, or are at least interested & compassionate, THANK YOU! You are a much needed rarity. We love you! All Dr’s & med staff need to watch this award winning documentary. It will change your outlook & perspective forever. You won’t believe the contents. MD’s & Professors explain why much of mainstream medicine has this illness so wrong. By forcing severe ME patients to do excercise and just saying they need to ‘do more’, can unfortunately make them significantly worse. I personally have been subjected to many of the exact things in this movie. During my most severe periods with CFS/ME in some hospitals, and although a small % of staff were very well intentioned and genuinely believed I could be helped this way, I unfortunately only got worse by being pushed even a bit too far. Psychologists were often at first very interested and compassionate. After speaking to other staff though, became aggressive and I was even berated for being as sick as they implied that many of my symptoms were just due to my ‘exacerbated stress levels’. Many staff threw around terminology, often very disregardingly, when I was alone in hospital really struggling to even move, saying things like.. “Yeah, we feel you just need to push yourself”. This became a common term for me, which many of them repeated, except those very few who genuinely knew it was much more than that and were a bit more understanding, or at least tried to be. I was discharged from one rehab hospital, and apparently it was because I wasn’t ‘cooperating’ enough to progress. Psychologists drove me to the point of tears with their aggressive manner by the end. Saying they were ‘extremely dissapointed’ with me for not trying and much more. Basically implying it was my fault for not pushing hard enough that I wasn’t getting anywhere. Watching this amazing movie brought tears, because these severe patients have been subjected to exactly what I was by certain medical staff, almost word for word in so many sections of this movie. Some of them have died since in their early 30s, and this is how they were treated. I couldn’t believe it watching. This just reinforces how wrong the perspective of ME/CFS still is in the general wide medical community. Here’s some of the terms I was subjected to, at my lowest points of this illness. Many with severe CFS have been treated exactly the same, and it can be extremely damaging. Please medical pros, take heart and be more careful what you say. Nurse: “Yeah you don’t need to be here”. Nurse: “Sorry, sorry, don’t want to get into it” ..walks away. Thanks for that, I enjoy coming into ER with 80/50 blood pressure barely able to stand up, just to waste your resources, because I find it amusing and fun. As opposed to being home with friends & family enjoying life. Doctor: “Heh, sure” (smirks) as he grabs a handful of tiny IV saline vials (like 10ml each) and literally throws them at me as they go all over the place on my bed, and he walks off. With my shaky hands I’m trying to break open these tiny vials and drink them, which does nothing of course. Doc: (mad and loud): “So you’ll take a bit of dirt from a naturopath but not tested medical drugs? ?” (waving his hand around at me). Doc: (scratches his head confused, walks away). – [Indeed, and thats fine, but it doesn’t mean nothing is going on. Perhaps look at the ME/CFS guidelines for the right tests to run? Allergies, MS, Lupus and more used to be treated exactly the same way before the mechanisms were understood. 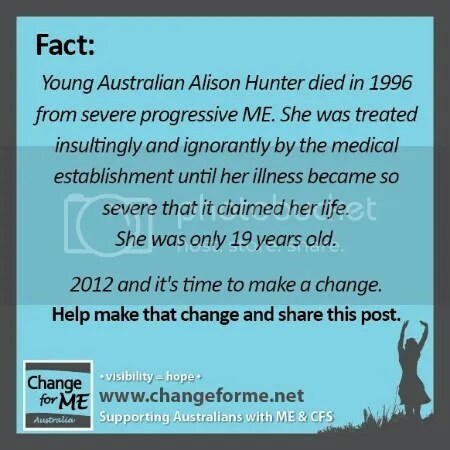 ME/CFS is no different. There has been much more of the same. The point to this is, I’ve spent the last 12 years of my life fighting hard to survive with an illness that is unknown to mainstream medicine. Not only have I had to fight alone and be my own doctor, but I’ve had to fight for one third of my life with the system that we, as human beings, rely on for our life, for our health – for compassion and support. Not to be fought against, berated, treated like an insignificant mental case that just needs to ‘pull it together’. I have done pretty well working things out on my own. However I am no where near well, and like others, still need some major help. We have not been given any priority, and are often just left to fend for ourselves. Some of the patients that died in this movie’s tests were fine too. But on autopsy significant disease was riddled within their spinal fluid & nerves, in the form of Dorsal Root Ganglionitis. I am, we are, as a community of desperate people.. begging mainstream medicine, to please be aware. See how significant this is, do anything you can.. change the world! We need you, because our lives are just passing before our very eyes, with no function, often in terrible pain, left in the shadows.. to fend for ourselves in silence. [Note 2018 – we are ever so thankful to have Prof Ron Davis & the OMF fighting on our side. Helping the world understand this so we no longer have to endure what I have). This is horrific. I am so sorry you have been treated this way. I know from experience blood tests being normal means nothing. Good luck and God bless you! Shame on doctors that can’t and won’t think outside the “box” and who aren’t compassionate! Thanks Jan. It’s ok I’m kind of used to it. However it’s not really “ok”. No one should ever be treated like this when so desparately ill. And yeah, people without compassion should *never* become dr’s in the first place. I dont think they realise how damaging snide / harsh remarks can be on such sick individuals. I went to emergency after a very scary crash where I couldn’t walk or stand at all. The ER Dr asked me what my GP thought was wrong with me and stupidly I said that I had a diagnosis of ME/CFS. I was then told ‘unless you have a medical problem we can’t help you here’. I was then put in a wheel chair and wheeled out to the footpath outside and left there. Eventually a passer by stopped and found a taxi for me and helped me in. Lee Lee, that’s awful. Similar level to the Dr throwing tubes of saline at me in a mocking manner. Seriously if there was an easier test to measure mitochondrial and ATP levels, they could see something significant. I do hope it’s something they can more easily test for soon, as it’s probably the most significant marker for us that is currently untested for. Makes me feel like throwing up…as did watching Voices from the Shadows (even though I knew what most of the contents were before watching). This is the scariest thing I can imagine – to have a disease that is so misunderstood the sickest of the sick are treated with not only ignorance but actual contempt. And on a routine basis. Every time I read or hear stories like this it makes me think of the hippocratic oath and ‘first do no harm’. Do those who treat PWME like this have ANY idea of the damage they do? Hey KP. Yeah.. watching the movie struck so many chords for me, and brought tears. It is the scariest. It’s literally like living in one long horror movie, where things just keep getting worse around you. Well not if you’re more stable, as you say you seem to be. I used to be like that too, and wasn’t too worried. I would get down now & then mainly when all my friends were going out to some big event or dinner together etc, and I was left home in bed unable to attend. Otherwise I’ve been rather positive most of my time with CFS (12 years). It’s been much harder and scarier since the end of November 2011 when everything came crashing down hard, and have been struggling to survive ever since. Its not good to say the very least. I hope & pray something big happens in mainstream medicine soon, so we can at least have a proper support network happening when we do need to go to hospitals etc. I suffered from severe CFS for years. Was told i had depression, that i was suffering from pysch disorders. What i indeed had was adrenal insufficiency, a liver that barely was working and all kinds of nutritional deficiencies. I was pushed HARD to be forced to work, each time i got a job i’d end up in hospital collapsing with near cardiac arrest. This is what we call a adrenal crisis. On and on it went for years like this, from doctor to doctor to specialist to specialist, i was told by one guy that i was a hypochondriac. I was brushed off by all of them whom ALL insisted i was suffering from a psych condition. When i was finally referred to a psychiatrist and experiemented on with a dozen anti depressants he came to the conclusion my issues were NOT psych related. Referred me back to my endo and i was back to the start, only now i was addicted to a sleep inducing anti depressant as WELL as having all my CFS issues. I finally got sick of the system and dropped out of it entirely and just let family support me. I started to research alternative medicine and my problems and educate myself. It led me to a knowledgable intergrative practioner who worked in my town, went saw him and he straight away knew what was wrong, picked i had CFS, adrenal insufficiency and that my thyroid hormone replacement which was thyroxine was’nt working in me. Moved onto natural thyroid and went straight down hill, then started hydrocortisone and some blood tests showed i had low normal levels of it. This allowed me to absorb and utilise the thyroid and low and behold alot of my issues went away, depression especially. I saw another doctor whom was in this field with CFS and pretty famous here in Australia whom also had new notions on why i had this disease, he conducted several tests and discovered i had high levels of mercury in my brain, and that i was infested with a parasite all through me. We started a anti candida and parasite program and i was able to drop my dose of hydrocortisone from 35mgs to 15mgs!! I then went and got my mercury teeth fillings removed and my health improved abit more again. Blood levels of mercury now returned to normal, incredible. I’m now working hard on my liver and detox issues, as well as trying to kill the parasites off and return my gut flora to a normal state. All in all i can honestly say had medicine and doctors been more informed about the many different causes of CFS and treated me for it properly right from the start i would’ve avoided being on hydrocortisone completely!! THey also insisted i take RAI which ablated my thyroid and left me thyroidless which was completely unecessary as it was parasites that were causing it to become overactive. Thanks to that i’m now left on medication replacement for the rest of my life and i’ll never be normal. Yes WAKE up doctors, if i can research for a few months and work out whats causing my issues and start on a program why can’t you idiots after years in a university not work out a thing. SHAME SHAME. I expect to hopefully return to some form of normalacy one day, there is hope now for me and hope is great. Before when there was no hope i seriously considered taking my own life. CFS is trully a devastating illness and its becoming very common. Nasty mate. All too familiar for many people. It sux and shouldn’t be this way. People should really only become doctors IF they care a lot about helping people, not just for the prestige. Yep, dealt with pretty much all that, even though I have fibromyalgia, probably not CFS (possibly getting there, though), so there’s no inflammation that I know of. Just lots of pain and fatigue, mostly pain that causes the fatigue. There’s a reason I started experimenting on myself to find out what helps and thank goodness I have one doctor that I can go to and he’ll prescribe me whatever so I can see what works. Really don’t know what I’m going to do when he retires. As for the ER stuff… well, I live in America, where people die because they’re poor. One of my friends who has stage 4 cancer in her brain and all over just had a bunch of issues with what passes for medical insurance/discounts here… they stopped her chemo because of paperwork. And now she can tell that the tumor in her brain is pressing on something to mess with her vision and make her face numb, etc. However, only the almighty dollar matters here, the US doesn’t care about life (unless it’s not born yet, but that’s a different rant). Yeah, it’s sad the way the medical system is. A big problem is also that it is just generally too crowded (on earth!) now, and there are too many sick people. So alot of staff have to deal with loads of emergency cases & tons of older people etc, while many of us younger ones with severe chronic illness get kind of pushed to the side, because there isn’t a ton of blood gushing from our jugular. Plus they can’t “see” the severe mitochondrial failure / ATP defecit, or the pain of Fibro etc, so they don’t think there’s that much wrong unfortunately. As stated in that video though, these illnesses are as significant as MS, AIDS and cancer. Just treated soo much less importantly, which sux for us.